A month-old female infant was brought to the emergency room because of reduced oral intake. Her mother related a birth history of a traumatic brain injury stemming from a difficult instrumental delivery. A nurse assigned to care for the infant observed what appeared to be blood on the right ear. She immediately alerted the on-duty pediatrician of a possible case of child abuse. The pediatrician concurred and ordered an anterior-posterior (AP) chest radiograph and AP and lateral skull radiographs. The AP chest radiograph (Figure 1) was interpreted in the emergency room as being “positive” for fractures of the ribs, and the skull radiographs (Figures 2, 3) were interpreted as “positive” for bilateral parietal bone fractures. Three-dimensional computerized axial tomography (3-D CAT) was performed (Figures 4, 5) and interpreted as “positive” for bilateral parietal bone fractures. The infant was hospitalized with a suspected diagnosis of child abuse. The AP chest radiograph (Figure 1) displays the head and neck turned right; outstretched upper extremities; bilateral normal ribs and costochondral junctions; normal density of the thymus gland to the right of the midline; normal bowel air, cardiomediastinal structures, and lungs. Definitive fractures and soft tissue abnormalities are not displayed. There is no evidence of soft tissue swelling. Figure 1 This is an anterior-posterior (AP) chest radiograph that displays the normal pediatric chest and thymus gland (arrows) without evidence of a fracture. C= clavicle; CC= costchondral junction; FR= first rib; RL= right lung; L= left lung; S= stomach. 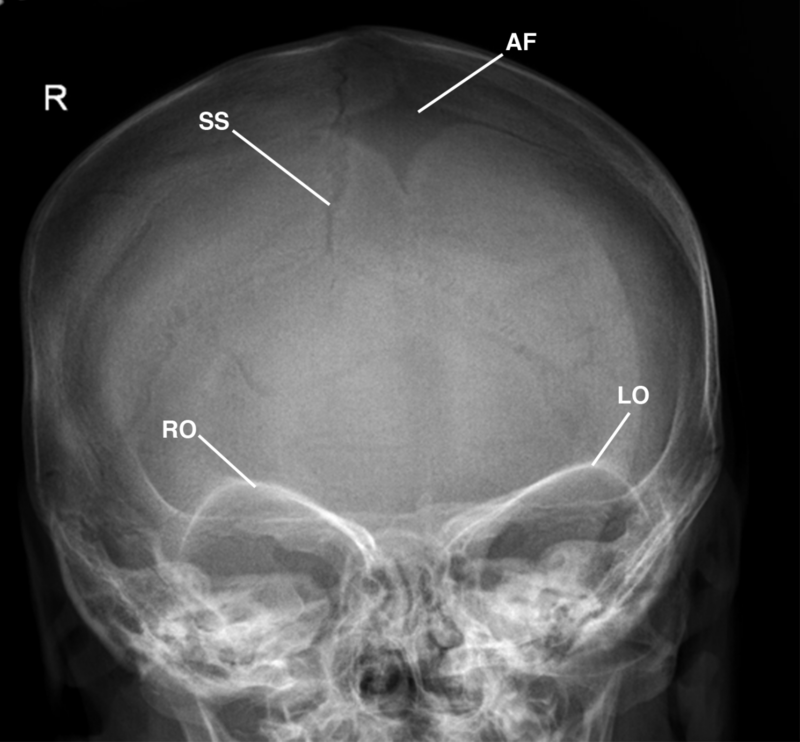 The AP skull radiograph (Figure 2) displays the head slightly rotated to the left with normal osseous and soft tissues. The lucency of the normal anterior fontanelle and sagittal suture are displayed. Figure 2 This is a normal AP skull radiograph without evidence of a fracture. Observe the normal anterior fontanelle (AF), right orbit (RO), left orbit (LO), and sagittal suture (SS) off-right of the midline without evidence of soft tissue swelling. The lateral skull radiograph (Figure 3) displays the normal appearance of soft tissues over the face, calvarium, and osseous structures; smooth margins of 2 under-ossified anomalous parietal sutures marginating the posterior superior region of the parietal bones; normal sutures at the junction of the frontal and nasal bone; normal anterior fontanelle; and the offset shift of the parietal and occipital bones at the lambdoidal sutures secondary to mild rotation of the head and neck. Definitive soft tissue swelling and air fluid levels are not displayed. 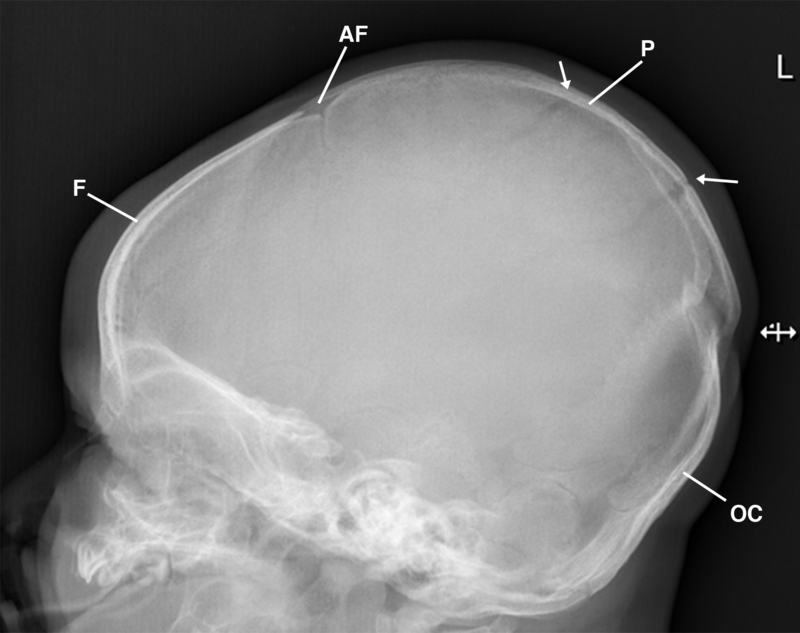 Figure 3 This is a plain lateral skull radiograph without evidence of a fracture. Observe the lamdoidal sutures in the parietal bone (arrows) reflecting the normal lateral projection (not labeled) stimulating the penumbra effect. AF= anterior fontanelle; F= frontal bone; OC= occipital bone; P= parietal bone. The AP 3-D CAT scan of the skull (Figure 4) displays the normal anterior fontanelle at the junction of the sagittal suture, coronal suture, and frontal suture; metopic suture dividing the 2 halves of the frontal bone; normal orbital bones; and the squamosa suture at the normal junction of the parietal and temporal bones. Definitive fractures are not displayed. Figure 4 This is an AP 3-D CAT skull radiograph without evidence of a fracture. AF= anterior fontanelle; F= frontal bone; P= parietal bone; SS= sagittal suture; Z= zygomatic bone. The lateral/sagittal projection of the 3-D CAT scan of the skull (Figure 5) cross references the AP image to display amorphous vascular margins superimposed on the normal bony plates of the calvarium; normal coronal, squamosa, lambdoidal, and frontal nasal sutures; under-ossified anomalous parietal suture dividing the parietal bone into unequal anterior and posterior segments as the smooth margin of the suture extends into the region of the sagittal suture; and the high dense X-ray artifact extending over the superior lateral parietal bone into the lambdoidal suture. Figure 5 This is a lateral/sagittal 3-D CAT skull radiograph without evidence of a fracture. Observe the landmark anatomic smooth margins of the parietal sutures (PS). CS= coronal suture; F= frontal bone; LS= lamdoidal suture; P= parietal bone; OC= occipital bone. AP chest radiograph is normal for cardiomediastinal structures, osseous, soft tissues, and lungs. Definitive fracture of the ribs and/or dislocation of the epiphyseal growth plates is not identified. AP and lateral skull radiographs are within normal limits and negative for fracture. Anomalous parietal bone sutures are displayed as above on the lateral skull and the 3-D CAT scan. Following notification of the final interpretation of the films, the pediatrician discharged the infant in the care of her parents. 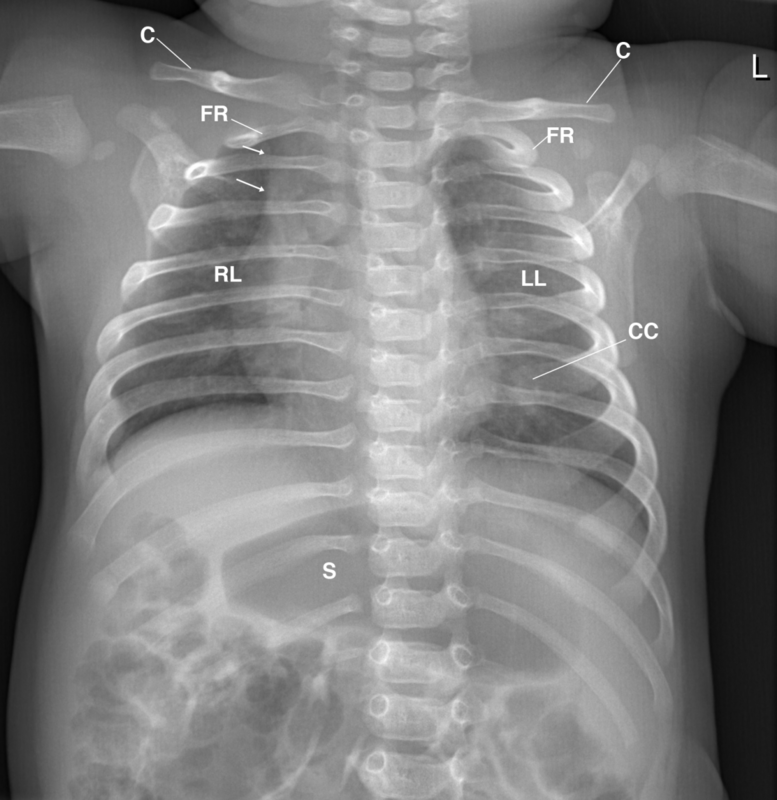 In infants, acute rib fractures can be difficult to see, especially if they’re incomplete, nondisplaced, or oblique to the X-ray beam; therefore, oblique views and bone scintigraphy may be required to localize the fracture site. However, in this infant’s AP chest radiograph (Figure 1), normal costochondral junctions of the anterior ribs were mistaken for fractures. The absence of soft tissue swelling over the costochondral junction of the anterior ribs, posterior ribs, scapulae, and humeri was an overlooked clue that no fractures were present. Skull fractures are classified as linear, compound, comminuted, and depressed. 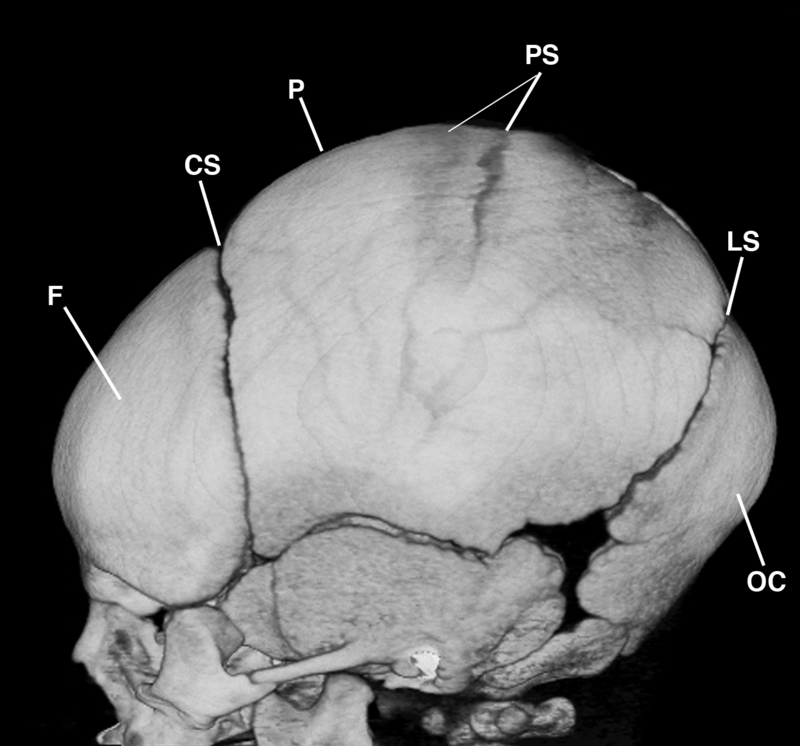 A linear parietal fracture of the skull is a difficult diagnosis to make, particularly when there are so many fissures, sutures, and synchondroses in the pediatric skull. Therefore, the pediatric skull can present difficulty in the interpretation of normal findings and pathologic changes. Though neonatal fractures occasionally occur during delivery, fractures at the base of the skull are rare. Linear or fissure fractures are generally the rule, and they appear as lines and strips of diminished density. 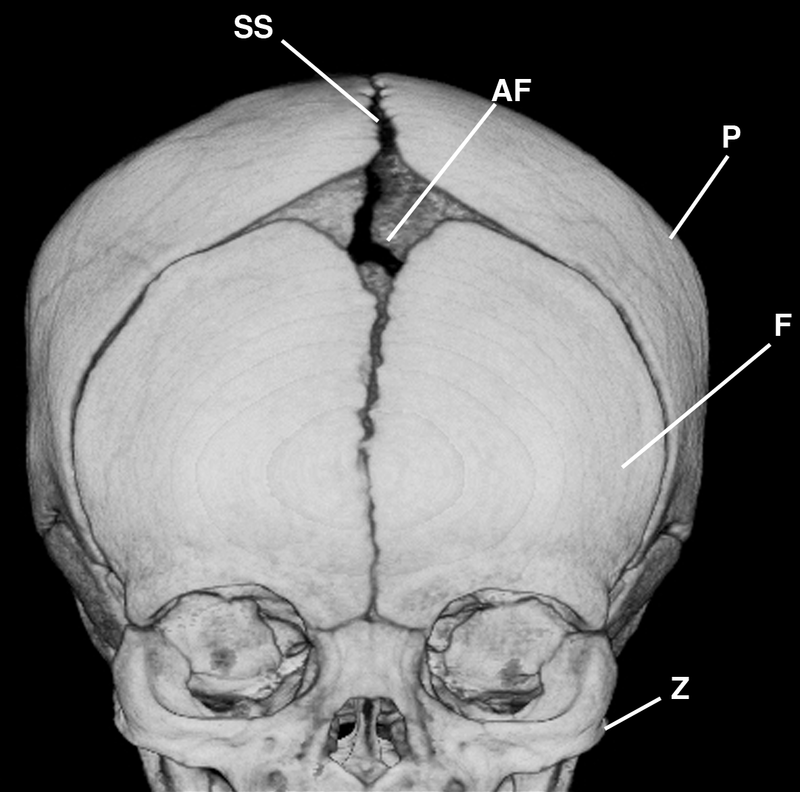 When a soft tissue density appears between the fracture segments, they may appear widely separated, which simulates wide sutures that normally separate the neonatal skull. Synchondroses at the base of the skull and the mendosal and metopic sutures are all present during the neonatal period and shouldn’t be mistaken for fracture lines. A residual superior segment of the metopic suture that simulates a fracture may also be displayed as arising from the frontal bone. However, none of those findings were demonstrated in the infant. In a full-term infant, there are 14 bones in the face and 8 bones in the cranium. The bones of the calvarium lie within incompletely mineralized membranous capsules separated by strips of connective tissues, and fetal presentation and neonatal molding may produce temporary overlapping of the calvarial bones (Figure 2). Therefore, the skulls of normal newborn infants may vary in size and shape. The anomalous parietal bone sutures displayed in this patient represent delay in ossification of the parietal bone,1 which is a normal — albeit rare — finding. Subsequent ossification usually occurs rapidly around 2 to 3 months of age, and the irregular appearance disappears at or before the age of 6 months old. It’s important to appreciate normal variations in ossification of the neonatal skull in order to avoid confusing that finding with pathologic ossification that may be displayed in conditions such as osteogenesis imperfecta, cleidocranial dysostosis, hypophosphatasia, and rubella syndrome. In older infants and children, the sutures and fissures are particularly troublesome because of their tendency to mimic fractures or calvarial defects.2 In the absence of soft tissue swelling, it may be difficult to distinguish an anomalous parietal suture from a linear fracture. The purpose of this presentation wasn’t to review the division of the parietal bone, but to inform physicians and health professionals that anomalous parietal bone sutures can be mistaken for fractures. The sutures of the neonate and infant skull aren’t true sutures, which makes it difficult to differentiate under-ossified membranous bone from fractures. That’s why PA and lateral chest radiographs should be obtained as baseline studies whenever possible. Knowledge of landmark anatomy, pathophysiology, and the patient’s history are crucial for arriving at an accurate diagnosis, because in the radiographs, you only see what you know. Failure to take those elements into account resulted in the radiographs of normal ribs and skull plates in a neonate to be misread as displaying fractures. 2. Caffey, J. (1972). Pediatric X-ray diagnosis: A textbook for students and practitioners of pediatrics, surgery, and radiology. (5th ed.). Year Book Medical Publishers. 3. Swischuk LE. The normal pediatric skull. Variations and artifacts. Radiol Clin North Am. 1972 Aug; 10(2):279-80. James D. Collins, MD, is Professor and General Radiologist in the Department of Radiology at the UCLA David Geffen School Medicine. 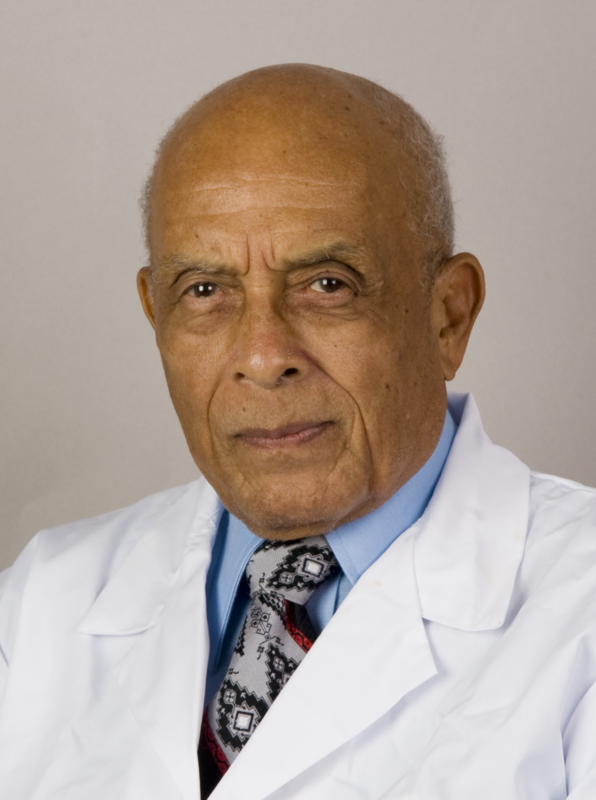 He formerly served as Director of the required medical student training for the department and President of the James T. Case Radiologic Foundation. Collins has an extensive background of publications, consultations, and editorial positions, including his current post as the Radiology Editor for the Journal of the National Medical Association. He specializes in bilateral 3-dimension MRI and MRA imaging of the brachial plexus and has been performing those studies since 1985.